Ted Wheeler also praises Police Chief Danielle Outlaw and declines to get into a fight with President Donald Trump at Thursday press conference. 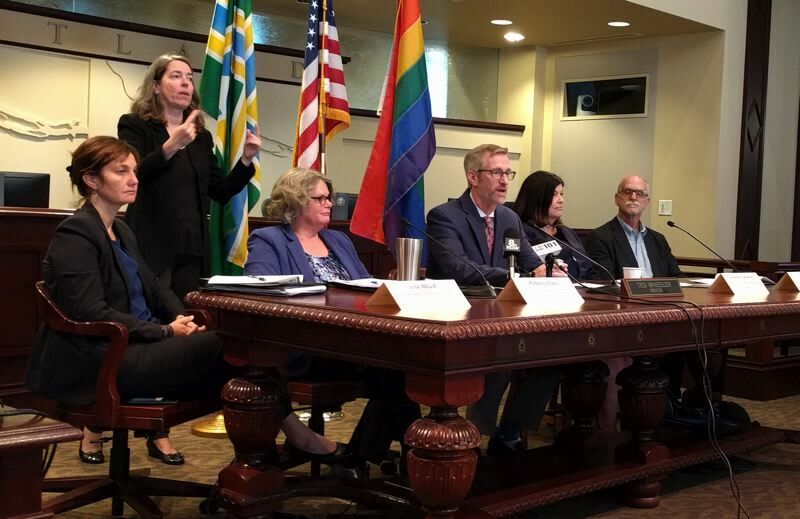 Saying that the city must speed up the production of low-income and working class housing, Mayor Wheeler has given the directors of four construction-related bureaus until early next month to recommend reforms to permitting process. "Reforming the permitting process is a priority for me and the rest of the council," Wheeler said during a press conference last Thursday where he was flanked by officials from the bureaus. Wheeler said that he has repeatedly heard from many housing developers that other cities issue construction permits faster than Portland, with some even saying the city could cut the issuing time in half without sacrificing its values. "I don't know if we could, but we should listen and try. A number developments are coming, and we should ask ourselves, what can we do to speed up the permitting process," said Wheeler, who reassigned the Bureau of Development Services (BDS) from Commissioner Chloe Eudaly to himself as part of the reform effort. It issues building permits in cooperation with other construction-related agencies, such as the Portland Bureau of Transportation. Seated with Wheeler at the press conference were BDS Director Rebecca Esau, Bureau of Planning and Sustainability Chief Planner Joe Zehnder, Portland Housing Bureau Interim Director Shannon Callahan, and Lisa Abuaf, development manager for Prosper Portland, formerly known as the Portland Development Commission. Esau said BDS has begun processing its first commercial construction permit through the Portland Online Permitting System, which is intended to eventually replace the paper permits the city now processes. "We are starting with commercial projects and will move to residential later," Esau said. Future large project cited by Wheeler included the Broadway Corridor that includes the former US Post Office Distribution Center at the south end of the Broadway Bridge, the property owned by the Oregon Museum of Science and Industry around its visitors center, and the land owned by the the Ziddell family in South Waterfront neighborhood. Although negotiations between the family and the city have broken down, Wheelers says he is contrinue to talk with them and is hopeful the redevelopment project can be saved. Wheeler also says he hopes to encourge development in Gateway and other areas in East Portland which have not yet benefitted from the economic recovery. He said significant development in East Portland would reframe the economy of the city for decades to come. • Praised Police Chief Danielle Outlaw as more than exceeding his high expectations after 11 months on the job. • Declined to respond to President Donald Trump calling on him to resign over his controversial handling of the protests against the federal Immigration and Custom Enforcement (ICE) agency. • Called for the federal government to adopt a "rational immigration policy" instead of abolishing ICE. • Said there was "no reason" why he would not run for reelection in 2020, although the final decision will be made in about a year after discussions with his wife and daughter.